*Once the grouping parameters are configured and transactions are posted, the target transactions can be updated by running a target update for a resource and for all resource of current legal entity through periodic batch. This sections details out the process to execute Target update. There is a process that is involved for updating the target transactions for a resource as on a particular date. This is available. Go to Project management and accounting > Projects resources > Resource lists > Setup > Target update. Once user click on Target update button, target transactions are updated accordingly. There is a periodic process that is involved for updating the target transactions as on a particular date. This is available. Go to Project management and accounting > Periodic > Projects+ BI Periodic > Target update. 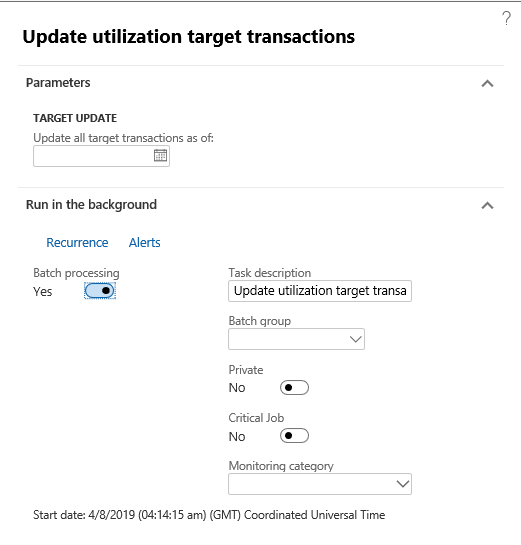 Once user runs this batch, Utilization target transactions are updated accordingly till the batch running date.